After eight months of practices and games, the CEU baseball season is two weeks away from being over. Western Nevada Community College will travel to Price this weekend for a four-game series to end the regular season. Then next week the region tournament will begin, and with a 9-27 record the Eagles are fifth and will be placed up against the number four seed in the first round of the tournament which looks to be Salt Lake. This has definitely been a frustrating season for the Eagles in many ways. Many one-run ball games just haven’t gone their way. CEU has lost nine games by two runs or less this season. Starting pitcher Jake Bankowski said, “We have done a lot of things right at different times, and if we could put them all together at the same time, we would be a great team. With four games left against Western Nevada, the Eagles would like to build some momentum and add to their 1-4 record against them. But no matter what happens this weekend, they will finish fifth, just ahead of Colorado Northwestern who remains in the cellar. Last year in the region tournament, the Eagles lost in the first round to Salt Lake Community College in a heart breaking 10th inning loss. But in the next game, the Eagles bounced back and pulled off the big upset as they beat Southern Nevada and eliminated them from the tournament. This year it should be interesting to see how the Eagles will do in the playoffs with their up and down performances. The Scenic West Athletic Conference, which CEU is a part of, has definitely been a national powerhouse in baseball. In the last five years, two national champions have come from this conference, in 2002 Dixie State College and in 2003 Southern Nevada. Currently both Southern Nevada and Southern Idaho are nationally ranked. Two weeks ago on April 13-14, CEU traveled to Las Vegas to play Southern Nevada. Game one of the series was a battle into extra innings which ended in favor of Southern Nevada. Thanks to a couple of base hits in the bottom of the eighth, CEU lost a tough one 5-4. Joe Via went 2 for 3, and Josh Ray went 2 for 4 with 2 RBIs. In game two, CEU was blanked 10-0, as the ten-run rule came into affect in the fifth inning. 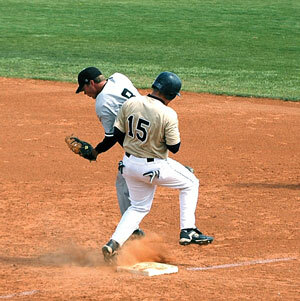 CEU had only two hits in this game, one by Brett Boyd and one by Via. On Saturday morning CEU lost again, this time by a score of 7-4. Boyd and Alex Rosenhan each went 2 for 4 in the game, while Via went 2 for 3 with an RBI. In game four it was Southern Nevada 14, CEU 2. Jens Wilson went 2 for 2, while Via and Rosenhan each added the other two hits in the game. The following week on April 20-2, CEU was home to Southern Idaho. Game one for CEU again was a battle to the ninth, ending in favor of Southern Idaho 2-1. Jake Bankowski pitched seven innings, giving up two unearned runs for CEU while striking out seven. In game two, Southern Idaho’s offense exploded for 13 runs to beat CEU 13-1. In games three and four played on Saturday, CEU again lost 6-2 and 7-0. With these four wins for Southern Idaho, they improve to 27-9 moving into first place, one game ahead of Southern Nevada at 26-10. Western Nevada is third at 23-13, Salt Lake Community College is fourth at 19-17, CEU fifth at 9-27, and Colorado Northwestern is in last place at 4-32. This coming weekend, Southern Idaho travels to Southern Nevada to see who will finish the season in first place. Depending on which team ends up in first after this series will affect where CEU will be traveling in two weeks for the first round of the region tournament. With the year coming to an end, some of CEU’s sophomores are looking to continue play at four-year schools. Of the 11 sophomores, three have committed to other schools already. Right fielder Brett Boyd and starting pitcher Marcus Hamatake have accepted scholarships to UVSC, also starting pitcher Jayson Madson has accepted a scholarship to Dixie State College. Other sophomore players will be moving on to play elsewhere, but they are still looking at their options before committing. Rosenhan is currently leading the team and league in batting average as he is batting an impressive .396. Boyd is right behind him batting .380 while also leading the team in RBI’S with 19, Wilson follows batting .271. As for the pitchers, Jayson Madson is leading the team in wins with four, while Jake Bankowski leads the team in saves with four. Bankowski has the lowest ERA on the team at 3.34, Madson is at 3.49 and Garrett Rose is at 4.50. CEU hopes to be able to finish strong and win a few more games before the end of the season. If they play together as a team look for them to come up with some big wins in the next two weeks. On Friday April 27 at 1 p.m., and Saturday at noon, CEU will play their last home games of the year. The college field is located on 1000 East and 900 North. “The one constant through all the years has been baseball. America has rolled by like an army of steamrollers. It’s been erased like a blackboard, rebuilt, and erased again. But baseball has marked the time.